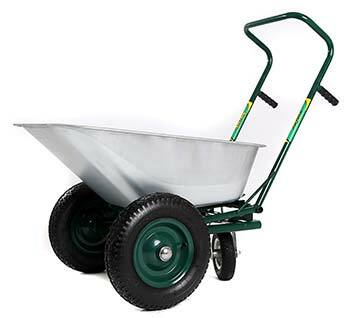 Baksaver Barrows – Baksaver Barrow is an award winning wheelbarrow that takes the effort out of pushing and tipping. The ‘Baksaver’ barrow is a unique and exclusive piece of equipment designed first and foremost for those who use barrows at work or for leisure. Ideally suited to the rigours of equestrian stable work and gardening plus any other use that entails work that could be damaging to back muscles, shoulder/neck muscles and wearing vertebrate joints. Designed in the UK the ‘Baksaver’ boasts a unique geometrical emptying system that entails an effortless step on a push pedal, then simply and easily pull back on the handles and hey presto the hopper is tipped and the contents ejected in a position of the operators choice. 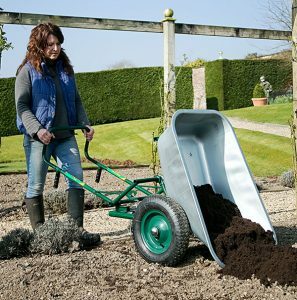 So, no back breaking under lifting of the handles and bending of the knees that can create back, hip and knee problems … the ‘Baksaver’ barrow takes the strain mechanically making mucking out and moving materials much less of a chore and lots more of a pleasure. The robust chassis and mechanism are constructed from steel and the hopper is made of rust proof galvanised steel for long life and durability. The large steel rimmed pneumatic front wheels and rear central jockey steering wheel allow for light and easy precise manoeuvrability through undulating rough terrain as well as tight awkward spaces. The ‘Baksaver’ barrow is a ‘WINNER’ having being presented with both the ‘Best New Product’ and ‘Innovation’ Awards for its category at the 2015 GLEE Exhibition in Birmingham. The target market is aimed at over-65s, semi-retired, retired and gardening enthusiasts. We are confident you will find the Baksaver Barrow an extremely desirable, sellable and profitable addition to your showroom portfolio and you will go on to sell many units as its popularity grows amongst end users nationwide.